AFP editor Chris Graham reports live from the Staunton Tourism Tradeshow, Monday, April 25, 2011. 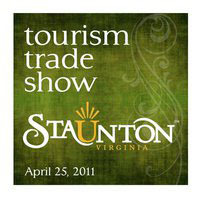 The Tradeshow is ongoing until 7 p.m. at the Stonewall Jackson Hotel in Downtown Staunton. More than 25 exhibitors – including our sister magazine, New Dominion Tourist – will be on hand to showcase what the Valley has to offer locals and tourists alike.